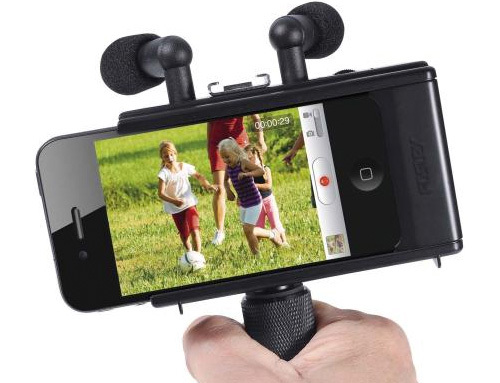 Fostex AR-4i Audio Interface For The iPhone 4 | OhGizmo! You may not realize it, but one thing that sets apart the ‘good’ YouTube videos from the crappy ones (or 99% of YouTube’s content from 99% of Vimeo’s) is the sound quality. The built-in mic on the iPhone, Flip or even digital camera that’s often used just isn’t up to snuff when compared to a full-sized camcorder. But, if you’re damned that you’re going to give up your iPhone 4 as your main content capture tool, please consider the Fostex AR-4i housing. It’s a fairly hefty add-on for the phone that interface with the device’s dock connector, adding 3 stereo inputs for connecting multiple microphones or even a line-in source. It comes with 2 powered condenser cardioid mics that can be positioned side-by-side for creating a stereo recording, or pointing in 2 different directions for capturing a two-person interview. A basic, but functional, 4 LED meter lets you monitor sound levels as they’re being captured, and a simple gain wheel lets you dial things back if they get too loud. And the whole thing’s powered by a set of 2xAAA batteries good for 8-10 hours, so it’s not a drain on your iPhone 4’s own battery. With a price tag of ~$150 though, it’s clearly designed at professionals who are using their iPhone 4 to make a living. Not a parent looking to capture baby’s first steps. capture baby’s first steps.” line. I would definitely say this product is for parents with disposable income to record their babies first steps, or college kids looking to make great bootleg Phish concert videos. Audio professionals would never use this. You could easily spend $2,000 on a good field recorder. I may very well use this to record my band’s live shows though. The video quality of the phone is great, but the audio is always horrible. This product looks perfect. Why would I want to carry around a whole FlipHD if I can just carry a set of speakers for the phone I already have? Brilliant.